Firebrands inundated us in a biting darting wind-driven torrent. We covered our faces with bandanas the best we could. Cinders rapidly burnt through our fire clothes since the Nomex had been washed out ten years ago. Any exposed flesh reported stinging, piercing pain. As the ember blizzard ignited some low lying brush and grass in our safety zone, many of us thought about deploying our fire shelters just to stave off the misery from the cataract of firebrands that sluiced upon us as if it came from, well …, a firehose. We didn’t get into our fire shelters because we stalwarted one another and enforced the code. We enforced our code of staying there and enduring and being tough. It was our code of pride, our firefighters’ fierce fearless feck. (Also, we didn’t want to get yelled at by overhead who would no doubt scream, “those expensive fire shelters aren’t for coddling wimps who aren’t tough enough!”) Soon the firebrand pulse subsided. We survived. We could breathe, beat out our pant cuffs that caught fire, and rub the painful scorches that burnt through our Nomex shirts. Multiple times I survived such blinding blizzards of embers. We always enforced that code of steadfastly abiding the flaming onfall. And each time we were there to put out the little nearby flames. Looking back on those incidences, I’ve decided that enforcing that code of stoically enduring firebrand onslaughts were some of the dumbest things I’ve ever done. And I can assure you that I’ve done plenty of dumb things. However, enforcing other fire codes that aren’t so dumb and remain the keys to reducing home ignitions and making responses to fires a whole lot safer. Cities don’t burn down like they used to due to modern firefighter quick response to fires, influential propaganda about fire safety, and structure code enforcement. Over the last 150 years, cities often directed firefighters to inspect and enforce fire codes. And by and large, it has worked. The more firefighters inspected and enforced, the less they went out on actual fires. Maturing and evolving standards in building codes have greatly diminished structure fires. These include codes for (1) manufacture of materials for construction, appliances, and electrical wiring, switches, and outlets; (2) proper construction and installation; (3) general clean-up and maintenance of buildings open to the public; and (4) maintenance of emergency exits. Professional inspectors for local governments and insurance companies have pretty much replaced firefighters assigned to inspect. In some places you can still see firefighters wielding clip boards and poking at exit signs. Because old cities have many wooden structures, effort went to setting up systems to quickly respond to fire emergencies. Rather than trying to save a doomed structure, firefighters focused on containing the fire and stopping its spread so it wouldn’t develop into a major conflagration or even into a firestorm. In the majority of these old-timey urban firestorms, the fire spread by firebrands. The raging inferno of one structure sent wind-driven sparks that ignited other structures until the fire consumed whole city blocks. While radiant or convective heat can spread fires in closely pack urban areas, most spot fires and dangerous spreads come from wafting firebrands. The inverse square law means that you can comfortably stand pretty close to a hundred-foot flame length, which every wildland firefighter knows who has ever stood near a torching subalpine fir. Several sorts of urban structural and building codes for materials, construction, and exit maintenance have analogies in the wildland-urban interface (WUI). Construction materials for WUI structures to resist firebrands are on the market such as fire-resistant siding, metal or fire resistant shingle roofs that can absorb a lot of heat. Research continues to evolve and mature to resolve home ignition zone (HIZ) problems unique to WUI conditions. But Climate Change has induced wildland fires to increasingly invade urban zones. We can’t “treat” enough of the wildlands to dampen the trend toward more megafires. However, we must prioritize fuel treatments around communities and engender incentives for reducing fuels on private lands to safeguard communities and reduce home loss. Blasts of information and a plethora of programs constantly hector homeowners to properly landscape, trim trees, prune bushes, rake yards, sweep tree debris from roofs, and remove flammable items away from houses. Excellent advice. 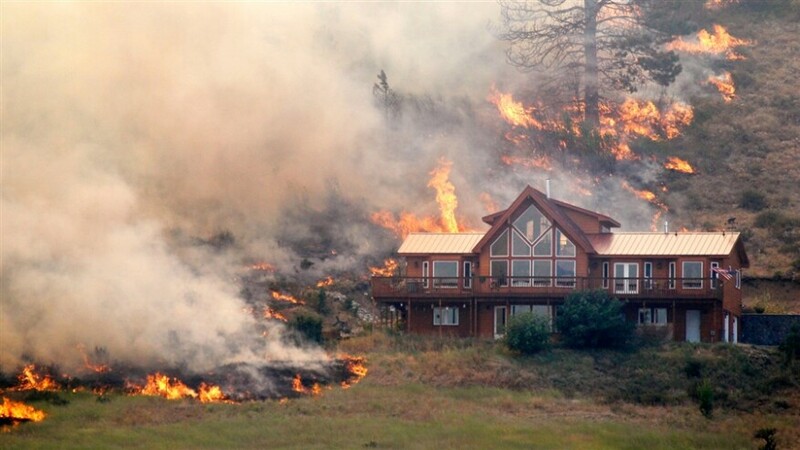 But due to the vicissitudes of wind, even the most conscientious homeowner, constantly observant in their Firewise efforts, may see their home burn down if their neighbors fail to be as vigilant. We have seen a multitude of incidences of tall trees, fairly unscathed, standing next to homes reduced to cinders. Why did one home survive in a scene that looks like the Dresden bombing? Analyses suggest that firebrands shower houses, igniting small fires where embers invade roof vents or enkindle bits of flammable debris. Without people present to stamp out tender flames, burgeoning fire eventually consumes the whole house. Recent research and modern modeling have fiercely focused on the complicit culprits of roof eaves and wooden patio porches (design, materials, and maintenance). Cohen’s research shows that even crown fires usually cannot radiate sufficiently to sustain ignition of house wooden siding. What could summon the best strategies to integrate wildfire, even domesticated wildfire, into a fire-hardy, fire-permeable WUI and a resilient fire-scape beyond? Hefting the necessary work of code enforcement in the WUI could quell many of these problems. Usually, local codes and ordinances already exist that demand action. Academics call operations in the Home Ignition Zone (HIZ), the 50 m nearby houses, “fuel treatments” or “hazard abatement.” Homeowners may call it landscaping and yard maintenance. Taxpayers shouldn’t pay for it anymore than taxpayers should pay for clean-up of unhygienic and dangerous rubbish on small private properties. Say, why do we pay for clean-up of corporate hazardous waste sites? However, local, state, and federal government can further facilitate information dispersal through excellent programs such as Fire Adapted Communities, Fire Adapted Communities Learning Network, and FIREWISE. Government can also incentivise insurance companies to become more proactive. Insurance companies could offer WUI dwellers fuel treatment premium discounts and easily monitor insuree performance. Enforcing the code on WUI structures and property, even by relatively cheap but effective satellite Google Earth View or drone surveillance, will boon benefits. Better eave vents can be cheaply and easily retrofitted. Perhaps simple genius can redesign eaves to be better in aerodynamically repelling firebrands. After residents have evacuated, how important is it to have firefighters present in the HIZ to protect WUI homes from firebrand ignition? Some insurance companies already fund private firefighting contractors to protect insurees’ homes during wildfire events. How these programs evolve will be important. They could become valued components among government and private efforts. Alternatively, without rigorous monitoring, they could become another “disaster capitalism” boondoggle. Heartbreaking urban fire fatalities still occur when fire safety and exit codes have been ignored. We are beginning to see the same in WUI evacuations, such as Australia’s 2009 Black Saturday wildfire and our recent Camp Fire at Paradise, California. Should we explore establishing programs similar to Australia’s “Leave Early or Stay and Defend?” This concept promotes early evacuations to prevent evacuees from becoming trapped on fire-vulnerable roads during egress from WUI. The “stay and defend” part recognizes that most destroyed WUI houses burn down after the initial wildfire pulse subsides but the house has a small ignition point (wooden steps, porches, eves, and vents) that could be easily extinguished if someone stayed present. However, the program paused after the deadly 2009 Australian Black Saturday bushfire that killed 130 home defenders and panic-fleers. Perhaps we can evaluate such a program after the WUI becomes truly fire-permeable or has reliable, fire-resistant community stockades. If embraced by the community and endorsed by fire agencies, certain well-trained volunteers may stay at the HIZ in protective (and perhaps certified) structures (homes, basements, or sheds) to be able to come out when it is safe, evaluate and triage the community’s situation, and put out small ignitions. Too little effort has focused on the sufficiency of WUI egress during critical times of wildfire panicked evacuations. This is where wildland firefighters can do more than wield clipboards and poke at exit signs. They can thin and prescribe burn WUI egress routes. WUI residents usually like the effects of routinely prescribed burns when it presents a favored savanna woodland viewscape. This will further make them heroes to local WUI residents in times when wildfires are not burning. And hopefully they won’t stand in the midst of painful firebrand showers imagining how tough they are.